Looking to explore the art, culture, and history of Northampton County? The Sigal Museum has it all! The Abel Opera House, Sigal Bridal Gallery, and the Sigal Museum all have one very big thing in common: their location. The Abel Opera House and Sigal Bridal Gallery evolved to what is now the historic downtown Easton’s Sigal Museum. I say “evolved” as the museum still pays homage to these previous tenants in many ways through their exhibits. 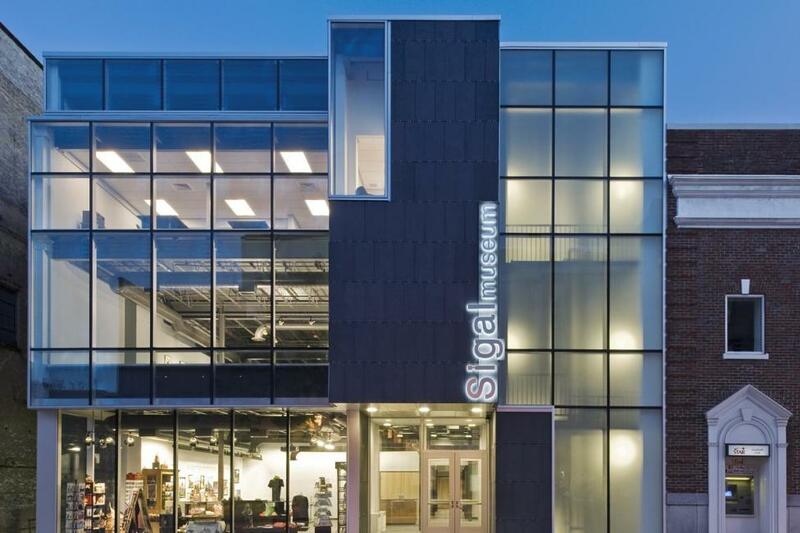 Opening in the summer of 2010, the Sigal Museum is a gem in the historic downtown, flying a bright red banner reading “History Here” on its exterior. The museum is a mere block from the Easton Farmers’ Market, and a must-see if you are in the area! There is something in this museum for everyone – adults and children alike. In a historical museum it is very rare to see signs encouraging children to interact with exhibits. The Sigal Museum has square stickers reading “Please Touch” - asking kids to play and have fun with history. Some of the interactive stations include fur pelts that can be touched, a touch-screen of Northampton County, musical instruments, and antique toys. They also have an “Eye Spy” game at the Victorian toy exhibit. For adults the museum offers “Guide by Cell” options at several stations to receive additional information on exhibits. Exhibits – yes, the important part. Our tour was led by a docent, who is a volunteer guide for the museum. We went through two shifts of docents who were both very knowledgeable and passionate about the rich local history of Easton. I highly suggest opting for a one on your tour of the museum. Our first stop was the John Austen Auditorium. This room houses the history of Northampton County and the Sigal Museum along with artifacts from the first courthouse and jail. The most fascinating components were the photographs of what the museum looked like as the Sigal Bridal Gallery. Our second stop was the main exhibit on the first floor. This floor had an array of different displays. Here you are led by a decal of the Lehigh River on the ground to create a flow to your journey through time. You start at the Lenape Tribe display that is staged with great detail, and was our docent’s favorite exhibit. This exhibit brings the outdoors inside with a realistic tree that extends to the second floor along with other artifacts. Traveling down the river we saw exhibits on local agriculture, Pennsylvania- German history, and cases of tools of conflict and industry. The river then winds down to a wall of historical photographs from around Lehigh Valley. At the foot of the wall installation is a touch-screen map of Northampton County with facts and information. If you choose to make your way downstairs to the lower level, you will find the Just Born exhibit. This exhibit is complete with old candy making tools, previous Just Born branding, an illuminated mock storefront, and a behind the scenes look into the Just Born factory. From here, we made our way to the top and last floor which consists of two galleries: The Decorative Arts and Charles Chrin Gallery. The Decorative Arts Gallery houses the Victorian toy exhibit and an array of hand crafted artwork such as paintings, coverlets, quilts, and Martin Guitars. Perhaps the most intriguing were the Victorian Hair Wreaths. I had seen images of the wreaths on the Sigal Museum website, but seeing them in person I realized the fine detail and how the images are three-dimensional. The hair wreaths are just that – hair. The wreaths are made from a collection of deceased family members’ hair or donated from close friends and family as a memorial. Once the collection was full, the wreath would be constructed and displayed. Another great piece in this gallery is a section of the original wall from the Abel Opera House which is recessed in the current wall of the Sigal Museum. The last gallery is perhaps the one being most talked about - the Eras of Elegance in the Charles Chrin Galley. The Eras of Elegance is a collection of the evolution of dresses and accessories of Northampton County residents from the 1750s to the 1920s. More than 25 dresses are on display with a vast amount of different materials, colors, and shapes. Our docent also pointed out color variations within the wedding gowns – see if you can find the subtle violet dress! Be sure to see this exhibit as it will only be on display until September 2015. If you want to explore the art, culture, and history of Northampton County be sure to check out the Sigal Museum! I hope you enjoy the museum as much as I did. Vanessa Palumbo is a resident of Bethlehem, PA and guest blogger. Don&apos;t forget to check out her blog, Resident Tourist.